Click the heart logo to read the latest update about Gunner's progress! From Gunner’s foster mom: We are pleased to introduce a truly amazing boy who came into foster care on February 24. Gunner had been diagnosed with some pretty serious health issues for such a young pup. His relinquishing family did not feel that they were able to cope with these issues, so we are grateful that they called ESRA. Despite obviously feeling unwell and being frightened by the multiple changes in his life, Gunner entered our yard with tail wagging, showing that he was willing to meet the resident dogs. Gunner came to us with all his worldly possessions – a huge bag of soft and squeaky stuffed toys, a bed that he is very attached to, and his required daily medication. We watched Gunner enjoy the day sniffing, finding outside toys to chew on, and interacting with the other dogs. He would have bursts of puppy energy followed by long periods of inertia. When it came to mealtime, Gunner refused to eat. While this is not unusual for a new foster dog, we were concerned not only because of his illness but because he was approximately fifteen pounds underweight. His ribs and spine showed through his skin. Out came the treats, but to no avail. Gunner did not have a meal until the middle of the next day, and he then took only a small portion of what he should have eaten. Later that day, we noticed that his breathing had become labored. For more information about Gunner’s medical issues, please follow this link to his Special Needs page. 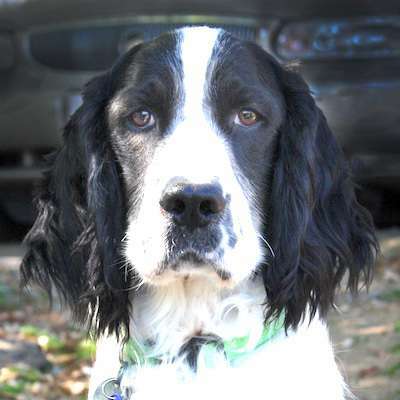 We have discovered that Gunner is one soft, squishy, cuddly Springer youngster! When you hold him on your lap, he just melts into your body. He loves his “stuffies” and sleeps with several in his bed at night. 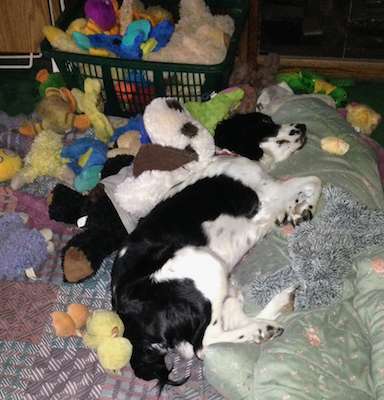 See the photo above -- not only did he pull out all those toys, but he also tugged the comforter off the couch so he could nap on it! When Gunner is outside, he enjoys sniffing his way around the property and engaging in brief bouts of play with the resident dogs. 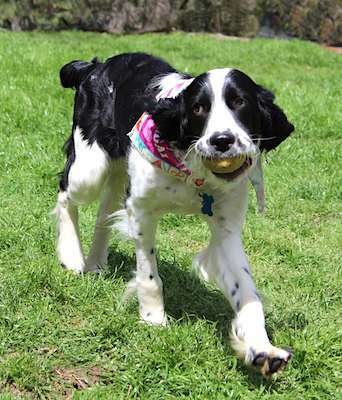 We know that Gunner will need another young dog in his new Forever Home. 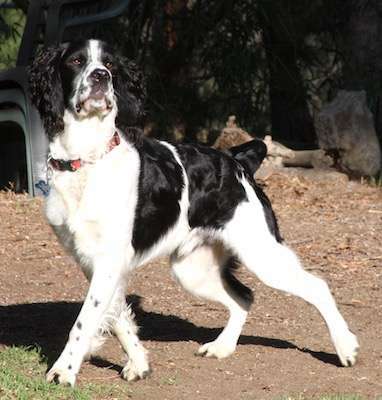 It is going to take some time for us to learn more about this boy and what will make him the happiest and most content Springer. Please keep checking back for updates as we get more acquainted with this handsome young love bug.